Customize your home theater with the help of this versatile and portable mini LED/ LCD projector. The 20,000-hour-rated projector lamp is designed to manually focus from 20 inches to 100 inches for both native 4:3 and supported 16:9 aspect ratios. 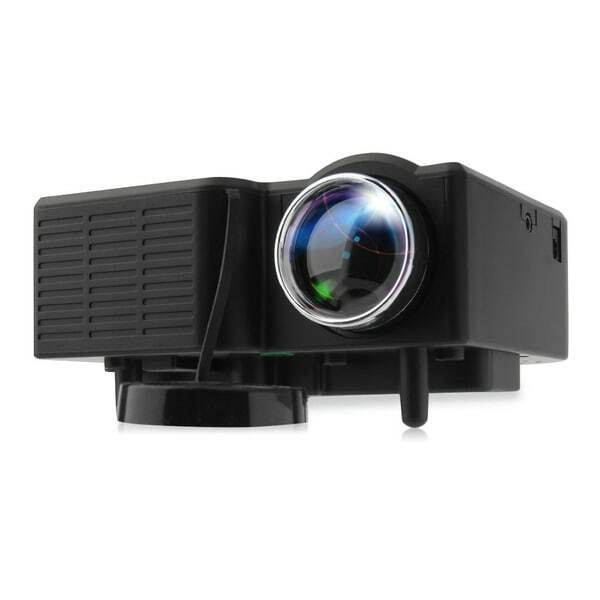 Compatible with US, EU, and UK plugs alike, this projector features a low-power consumption supported power supply for easy and long-lasting use. Unable to get it to focus and tried all distances and completely dark room. Menu button on remote has to be read in the projected image and cannot read the options since thing won't even focus. Waste of money. Its so hard to use this projector I can barely even read the words on the screen at all, no matter the distance or how much I adjust it, it is still blurry. It's almost impossible to sign into netflix or anything like that without being able to read the letters. It kills me and my family's which makes for a horrible movie watching experience. complete trash should not be sold on here or anywhere for that matter. And they wont return it unless i pay *** shipping its bs its not my fault you sold me trash. "Is this projector good to project art on a wall/canvas for mural work?" "Will this projector work with an iPhone or iPad?"